I am off to Houston first thing in the morning for the International Quilt Festival and then I will be flying back to Chicago Saturday morning to go to SOFA. I am so bummed this year I have to split my time between the two shows. I love them both! I probably will be off line until I get back and post pics. See ya then. Oh, by the way, I just saw Quilting Arts Gifts at Borders!!!!! There are some fantastic projects in here. You have got to get a copy. 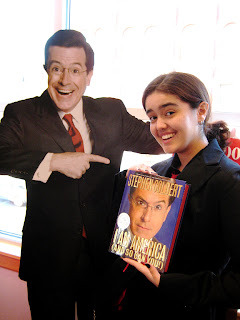 We also ran in to this handsome guy at Borders. Unfortunately he seemed a little two dimensional. 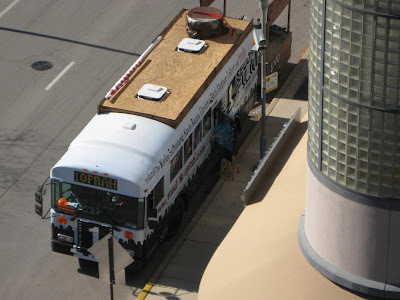 This bus showed up at Oprah's studio yesterday. It is parked out there today (photo taken from my 5th floor balcony). There is a website printed on the side of the bus RoadtoOprah.com. Evidently this is a community film project to raise money for charity. Click on the link to see a short film explaining the project. 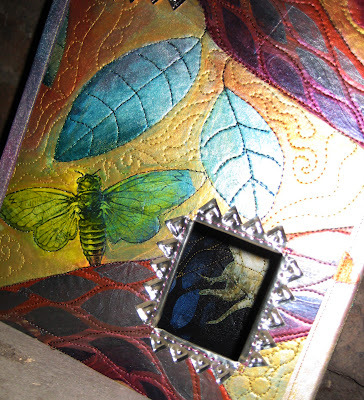 I wrote an article for the upcoming December issue of Quilting Arts magazine on painted batting. The Warm Company wanted to do an ad tying in to the article and wanted to use some of my artwork for the ad. Unfortunately the only painted batting pieces I had were used in the article. I felt bad about this and decided to come up with something they could use in their ad and sent them a photo of this the next morning. This is 12" x 12" painted batting. There are 9 two inch painted batting squares appliquéd to 9 four inch painted batting squares that are pieced together with a wide zigzag stitch. 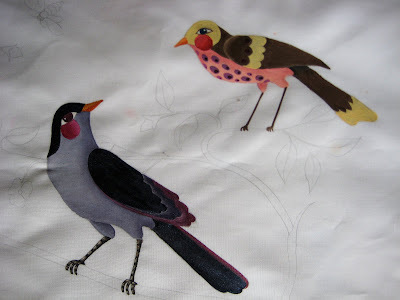 It is painted with Lumiere textile paints and machine stitched. If you go to Quilt Market you will be able to see it in the The Warm Company booth. 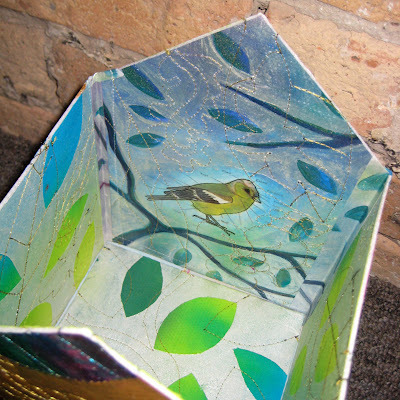 If you go to Festival I will have it with me during my painting demos in Make it U's Open Studios. Pam tagged me for 7 odd things about me. Well, last May I was tagged for 7 random things about me. I think at least 5 of my 7 random things could be characterized by many as odd. So instead of boring anybody by repeating it, if you are interested you can check out my oddness here. The first annual Quilting Arts Gifts magazine is soon to hit the shelves at a store near you or you can order your copy here. 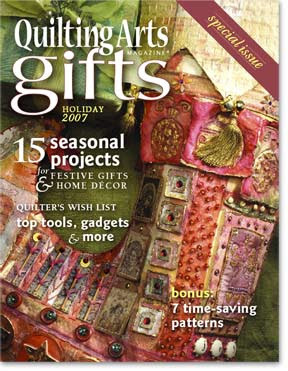 I have two projects in this special issue, an advent calendar and ornaments that are little painted quilts with embossed metal frames. The stocking on the cover was made by Beryl Taylor, it is so gorgeous. 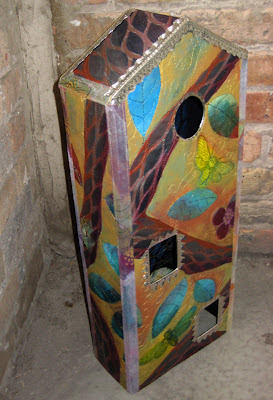 I saw it at the studios in Cleveland when I was shooting my segment for Quilting Arts TV. This summer I picked up Vogue knitting (Fall 2007) and fell in love with this pattern. It is free on the Vogue Knitting website. I was able to read about other people making this pattern on Ravelry and by googling the pattern name to see what issues people had when making it. I love the internet. I found several people said it ran a little large, and a couple extended the length and added 3 buttons to the top instead of two. I think I will make these adaptations to the pattern. When I knit my swatch, I found I had to go down two needle sizes from an 8 to a 6 to get gauge. So I decided I would cast on the bottom for size small but knit it with size 8 needles and then switch to the size 6 needles and knit the top half in size medium. This saved me casting on about 50 stitches. 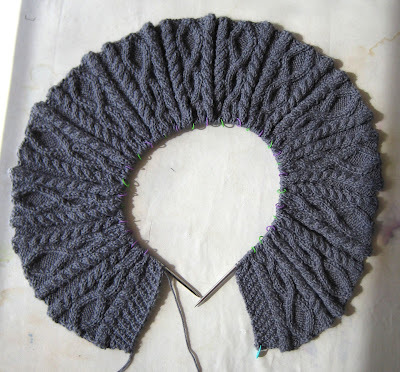 I am knitting this in Knitpicks Andean silk in the color slate. 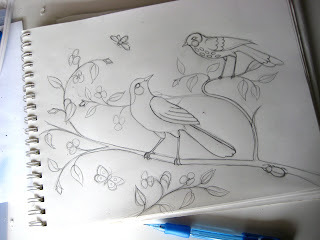 This is my preliminary sketch for the piece that I will paint in Houston at Make it U's open studios. After I get the pencil drawing worked out to my satisfaction, I draw over the lines with a fine point pen and then erase the pencil. 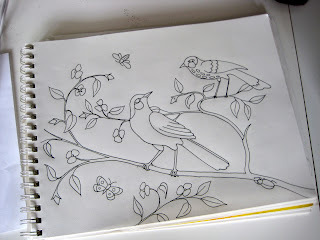 It is very easy to see the lines through a piece of white cotton fabric and trace them with pencil onto the fabric. I know in 2 hours of working and chatting I will not make fast progress, so I wanted to get it started so people would have something to look at besides a white piece of fabric. I have worked out some of the more complex color decisions before hand by painting the birds. This will make it much easier for me to talk and paint without having to concentrate so much on the actual painting. Yesterday my daughter and I did portfolio day at the Art Institute. We spent four hours standing in long lines to have her portfolio reviewed by our top picks for Art schools in the country. We did this last year too. That time each school we saw gave her very conflicting advice about what they wanted to see in a portfolio. One said more drawing another said nothing but design work but they all said she had too much stuff. I kind of knew that, but she had so much good work in so many areas that I thought we should show a decent sampling of her talents. This year we narrowed it down concentrating on graphic design work. We made sure she had a good selection of life drawing, still life’s, gestural, line, and rendered pencil drawings, a few photos, (she has an excellent eye but that is not her intended major), several logos, package designs, identity packages and several pieces that involve photo collage combined with drawing and design elements. This year the response from the schools was amazing. They all said very similar things. Every one was very positive the only suggestion was to take a couple projects to a more finished level (photographing the final product) when submitting her portfolio. We saw Otis (where I went to school), Art Center, RISD (the hugest lines), the Art Institute and then we ran out of time. 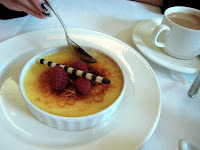 We celebrated her success with lunch at the Art Institutes museum restaurant. Yumm. I think her first choice is Art center, followed by Otis. I don’t think any of us are ready to send her off across the country to go to school next year on her own though. So we may do a year of community college and work on getting those SAT’s taken. Then really start investigating scholarships, boy is art school expensive. Woo Hoo Fauna wins at PIQF! 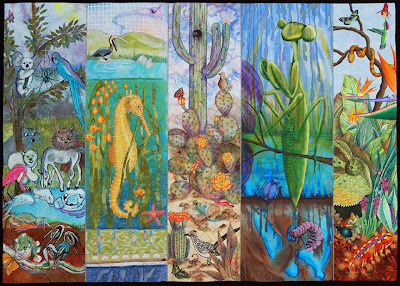 Our group quilt Fauna won second place Innovative at PIQF! The name listed with it is The Gomez Sisters, that is our group identity. It was made by (in order of panels left to right) Frances Alford, Kathy York, Vickie Hallmark, Julie Upshaw and me. 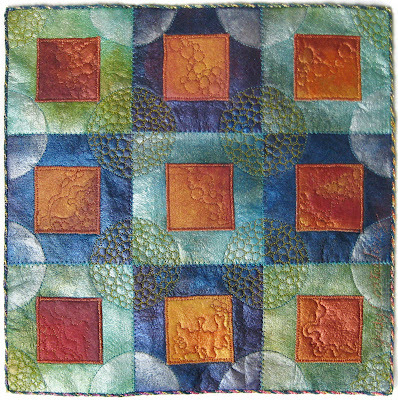 You can see this quilt in detail in the April/May 2007 issue of Quilting Arts magazine. 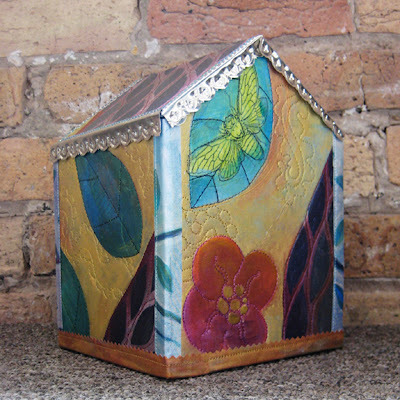 This is the second house constructed with the painted fabric I made and used for the cicada house. This house is 6" by 8" tall. Much easier to construct at this size than the 22" tall first house. 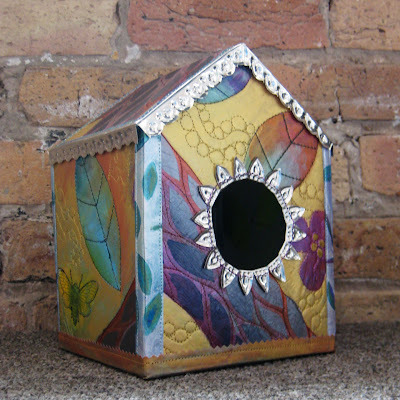 The inside is painted with pearl white textile paint on hand dyed fabric. The fabric is showing through on the colored leaves. I cut the leaf shapes out of freezer paper, after ironing them to the fabric I painted it white. 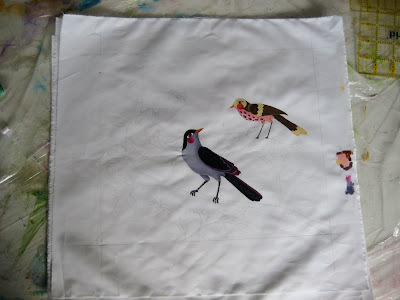 The bird on the back is a bird diagram that was collaged to the fabric with gel medium as I was painting. 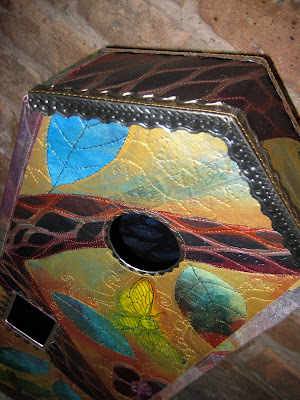 You can see the bird on the back wall when you look through the hole that I wrapped with cut embossed metal that is machine stitched in place. The strips of metal have been cut with decorative scissors and stitched to the top of the roof. 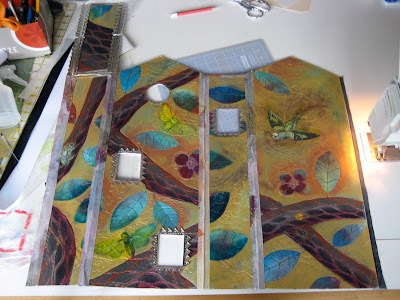 The I draw on the metal with a ball stylus and fold the edges down to attach to the sides of the house. 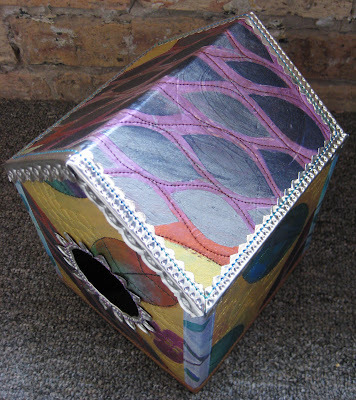 I am thrilled to once again participate in Cloth Paper Scissors Open Studios at Make it University during Quilt Festival this coming November 1st and 2nd. That's just 3 short weeks away! 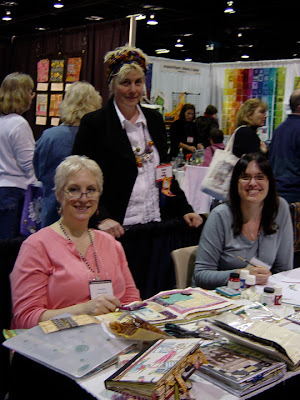 Make it U is the brain child of Pokey (Patricia) Bolten Editor of Quilting Arts magazine. Make it University consists of hour long classes for $5 held on the convention center floor through out Quilt Festival. 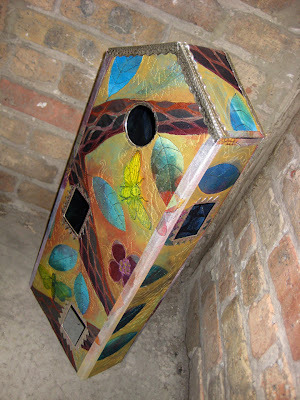 Open Studios is an opportunity to visit with artists who will be working/demonstrating different techniques. 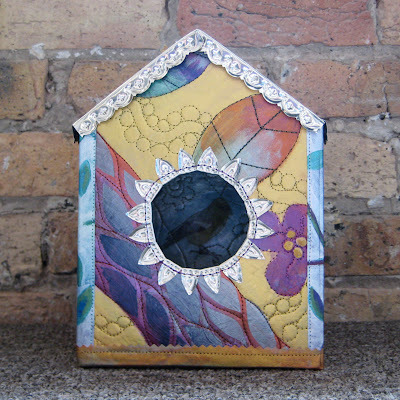 I will be painting fabric and Frances Holiday Alford will be demonstrating her encrusted beaded quilts on Thursday and Friday afternoons from 2 - 4 pm. Please come by and say hi if you are at Quilt Festival. Join Judy Coates Perez, Lesley Riley, Beryl Taylor, Tracie Lyn Huskamp, Marilyn Huskamp, Lisa Engelbrecht, Patricia Bolton and others for live demonstrations of making artwork in the Open Studios portion of Make It University. Schedule of artists will be right on the show floor and will change daily. 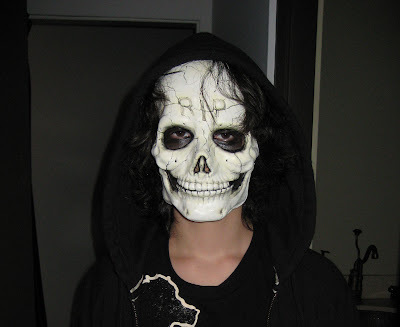 Everyone in my house has been sick in one way or another this week, except for me. And now I am tired. I really hope this doesn't mean it's my turn. My inspiration for the theme of this house came from an experience I had this summer. The house is finished. It is 22 1/2" tall, 9" wide and 4" deep. To construct it I made one inch wide strips with fusible web on the back. I used left over strips from my last painted project for the outside strips and I used the dark blue cotton matching the back side for inside. I fused a strip on the back first and then fused a strip on the outside while bending the edge to create a bent corner. Then I stitched along the edges. I added strips of metal to the roof, that had to be sewn on pretty early in the construction. Once the whole body of the house was put together, I bent the metal along the roof edges and used E600 to glue the top of the house to the metal edging. 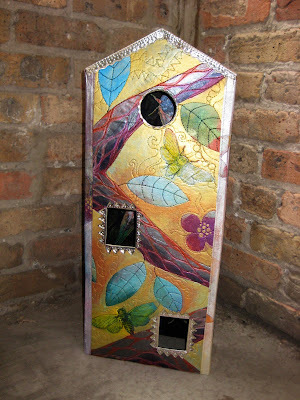 The last thing I want to do is make a metal edge for the bottom of the house to finish it off.